A rare tumor of the chromaffin tissue, pheochromocytoma is characterized by increased secretion of catecholamines. Pediatric cases represent only 5% of all pheochromocytomas. 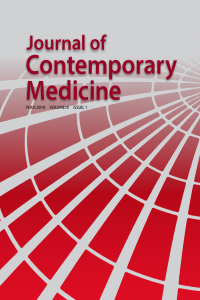 In this report, we presented anesthesia management of a 17-year-old girl who would undergo right suprarenal mass excision due to pheochromocytoma accompanied with familial Mediterranean fever (FMF). Preoperative blood pressure control was achieved with phenoxybenzamine. General anesthesia was established with thiopental, vecuronium, fentanyl, and sevoflurane. Sodium nitroprusside and phentolamine was used for perioperative blood pressure control. Tramadol and diclofenac were administered for postoperative pain. The patient was discharged after a good preoperative preparation and perioperative management with uneventful treatment period. Kromafin dokularının nadir bir tümörü olan feokromasitoma yüksek miktarda katekolamin salgılanmasıyla karakterizedir. Bu tümörlerin sadece %5’i çocuk populasyonunda tanımlanmıştır. Bu makalede feokromasitomanın yanında Ailesel Akdeniz Ateşi (FMF) de bulunan 17 yaşındaki kız hastanın sağ sürrenal kitlesinin eksizyonu için uygulanan anestezi yönetimi sunuldu. Hastanın preoperatif kan basıncı kontrolü fenoksibenzamin ile sağlandı. Genel anestezi uygulaması için tiyopental, vekuronyum, fentanil and sevofluran tercih edildi. Peroperatif kan basıncı kontrolünde sodyum nitroprussid ve fentolamin kullanıldı. Postoperatif ağrı kontrolü tramadol ve diklofenak ile sağlandı. Hasta iyi bir preoperatif hazırlık ve peroperatif yönetimle sorunsuz tedavi sürecinin ardından taburcu edildi. 1. Pham TH, Moir C, Thompson GF, et al. Phaeochromocytoma and Paraganglioma in children: A review of medical surgical management at a tertiary care center. Pediatrics 2006; 118: 1109-1117. 2. Hack HA. The perioperative management of children with phaeochromocytoma. Paediatr Anaesth 2000; 10: 463-476. 3. Weir PS, McLoughlin CC. Anaesthesia for caesarean section in a patient with systemic amyloidosis secondary to familial Mediterranean fever. Int J Obstet Anesth 1998; 7: 271–274. 4. Prabhu M, Joseph TT, Shetty N, Chaudhuri S. Child with bilateral pheochromocytoma and a surgically solitary kidney: Anesthetic challenges. Saudi J Anaesth 2013;7:197-199. 5. Ein SH, Pulleritis J, Cheighton R et all. Pediatric pheochromocytoma. A 36 yr review. Pediatr Surg Int 1997; 12: 595-598. 6. Harish R. Pheochromocytoma resection: Current concepts in anesthetic management. J Anaesthesiol Clin Pharmacol. 2015 ;31(3) :317-323. 7. Turner MC, Lieberman E, De Quttro V. The perioperative management of pheochromocytoma in children. Clin Pediatr 1992; 31: 583-589. 8. Batra YK, Rajeev S, Menon P, Saxena AK, Rao KL. Anesthetic management of bilateral pheochromocytoma with paradoxical hypotension in a 11-year-old child. Paediatr Anaesth. 2007;17:295-296. 9. Lenders JW, Duh QY, Eisenhofer G, Gimenez-Roqueplo AP, Grebe SK, Murad MH, et al. Pheochromocytoma and paraganglioma: An endocrine society clinical practice guideline. J Clin Endocrinol Metab 2014;99:1915-1942. 10. Simon A, van der Meer JW, Drenth JP. Familial Mediterranean fever—a not so unusual cause of abdominal pain. Best Pract Res Clin Gastroenterol 2005; 19: 199–213. 11. Oka T, Oka K, Hori T. Mechanisms and mediators of psychological stress-induced rise in core temperature. Psychosom Med 2001; 63: 476–486.